armed intruder who tried to rob his dairy yesterday. A would-be robber got more than he bargained for when he pointed a knife at a Waitara dairy owner in Taranaki yesterday afternoon. A man walked into the Raleigh St Dairy at about 2pm and made his way behind the counter to where owner Pran Sharma was sitting, making up orders, Sharma said. The intruder pointed a knife at him and demanded money and cigarettes. But Sharma was having none of it. He hit the intruder with an electric kettle and as the man moved backwards Sharma grabbed a jar of lollies and whacked him again. "I was not scared. I tried to grab the knife," he said. "He was lucky to escape. I was really angry." The exchange lasted less than a minute, before the man took off out the door with Sharma after him. Sharma chased the robber across the road, yelling at him to stop and come back. But the man disappeared up a side street. When Sharma returned to his shop a neighbour told him he had called the police. 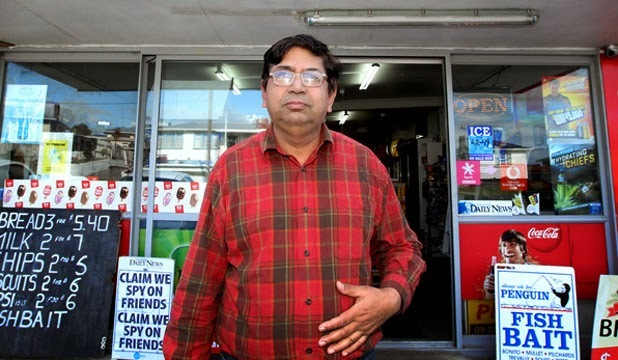 Sharma has owned the dairy for more than two years and has only had one other problem, when a man tried to get into the dairy when it was closed. He was caught on the security camera, recognised and went to jail, Sharma said. And he was confident the police would catch this intruder. Detective Mike Thorne of Waitara CIB said police were still looking for the offender. They had footage from the dairy's surveillance system and he was confident local knowledge would produce some information. In the last fortnight, two shops in South Taranaki had been targeted by armed robbers wanting money and cigarettes. On September 1, Hawera's Subway Dairy owners were allegedly threatened by a teen armed with a small pistol. An arrest has been made in the case and a 17-year-old Hawera man is due to reappear in court on October 7. And last Saturday, the owners of Chris's Dairy in Opunake, were confronted by a man wielding a large kitchen knife.